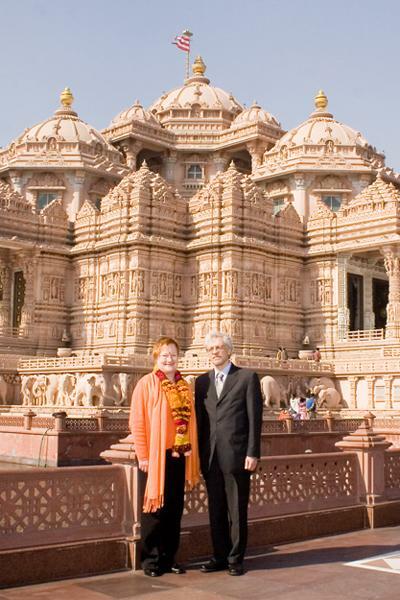 The President of Finland, falong with her spouse Mr. Pentti Arajarvi, visited Akshardham Monument on Sunday, 21st Jan 2007. Other members of the delegation included Mr. Pertti Torstila, State Secretary, Ministry for Foreign Affairs, Mr. Asko Numminen, Ambassador of Finland to India, , Veli Sundback, Executive Vice President, Nokia, Jan-Erik Enestam, Former Minister of Environment, MP and several CEOs of Finnish companies. The President arrived at 11.00 a.m. She was welcomed in the traditional Indian way with the tying of the nadachhadi on her right wrist, tika on the forehead and garland at the Mayur Dwar. 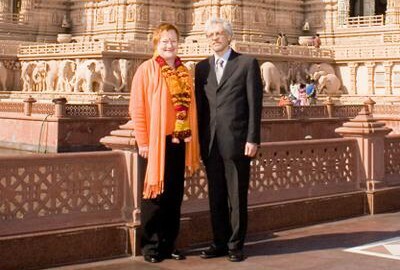 The group visited the main monument and were amazed to see the intricate carvings, beautiful stone and marble figures, images of gods and goddesses, sadhus and sages and narratives from the great Indian epics, Ramayan and Mahabharat. The group also appreciated and enjoyed the Boat Ride exhibition. The President and her spouse performed the ‘Abhishek’ ritual on Shri Nilkanth Varni. 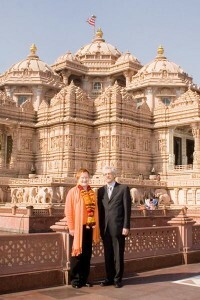 The President opined ‘Many thanks for your excellent introduction to the history and the culture of India. I believe that your wisdom will help all of us to make better and more sustainable world’.